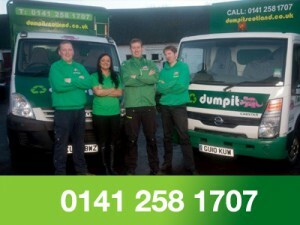 Dumpit is a junk removal company operating in the Scottish central belt. We have been in business for over 5 years, directing hundreds of tonnes of junk away from landfill, recycling unwanted materials and donating reusable items to charity. We offer a same day on demand service, arriving in pre-arranged two hour time slots. You don’t need to lift a finger, allowing you to sit back and relax as our friendly, professional staff do all the heavy lifting and loading for you, leaving your space junk free. When conducting clearances our team will leave your property tidy and clutter free. Our staff will wear overshoe protection to protect your flooring from marks and scuffs. We also sweep up once the clearance has been completed. We are committed to ensuring as little waste as possible ends up in landfill sites. 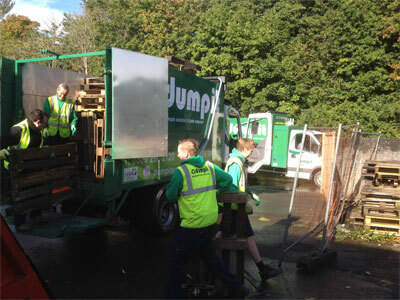 We extract all recyclable materials and donate all usable furniture to our network of charities, meaning that we recycle 80% of all junk we clear. These guys were very professional, helpful and arrived bang on time. They did an amazing job and took away everything they possibly could for the price. Great service, highly recommended. Dangerous driver, no knowledge of highway code or respect for other road users. The box at the rear of our trucks is 13.5 cubic yards. This works out at about the same space as 2¼ domestic skips (each skip has a volume of 6 cubic yards). Is it possible to get a quote over the phone? While we are able to give an estimate, we are unable to give you an exact price as we would require to visit the premises to give you an exact quote as our prices are based on the amount of junk being removed. Once at the premises your truck team will provide you with a no obligation, free quote. House Clearances: Sofas, beds, wardrobes, bookcases, tables, counter tops, mattresses, etc. Garage and Loft clearances: boxes, clothes, books, lawnmowers, tools. Garden Waste: gravel, plant matter, timber, grass, leaves, soil, old sheds, greenhouses, etc. Electrical Appliances: fridges, televisions, freezers, washing machines, stereos, computers, etc. Construction: concrete, timber, pallets, glass, plaster, metal, paving, etc. Roofing and Flooring: Carpets, Tiles, slate, general flooring, etc. Office Clearance: desks, confidential document destruction, chairs, computers, etc. Can you take hazardous waste? Unfortunately, we are not licensed or insured to carry hazardous materials. Call your local recycling or waste management hotline for further assistance. Not always. 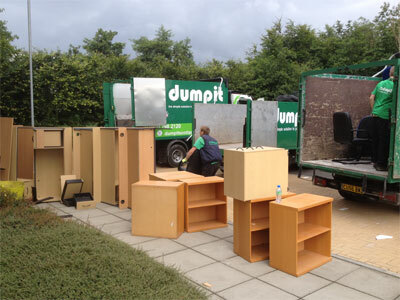 Provided we can access the junk from the road, we will call you once on site with an exact quote. Equally, account customers often arrange for collections to occur without someone on site and we simply invoice you, following completion of the job. Repeat customers do not need to be present as long as we already have your payment details on our system. What areas of Glasgow do you operate in? 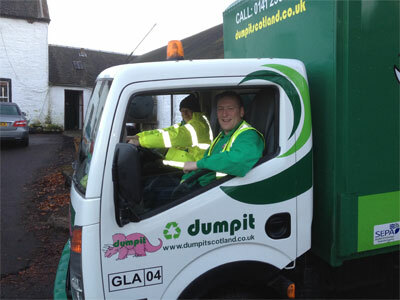 We will come and pick up you junk anywhere in the greater Glasgow area including City Centre, Partick, Easterhouse, Springburn, Cumbernauld, Dumbarton, Bishopbriggs, Cambuslang, Clydebank, Coatbridge, Giffnock, Johnstone, Newton Mearns, Paisley, Renfrew,Milngavie, Stepps, Uddingston and many more. What areas of Edinburgh do you operate in? We cover all of these Edinburgh postcodes:EH1 EH10 EH12 EH13 EH14 EH15 EH16 EH17 EH2 EH20 EH21 EH28 EH29 EH3 EH30 EH4 EH5 EH6 EH7 EH8 EH9Therefore, whether you are in Balerno or Bruntsfield, Corstophone or Comley Bank,Dalry or Duddingston, Grassmarket or Haymarket, Marchmont or Morningside, Sighthill to Stockbridge, we will will be able to remove your junk in a quick and effective manner.